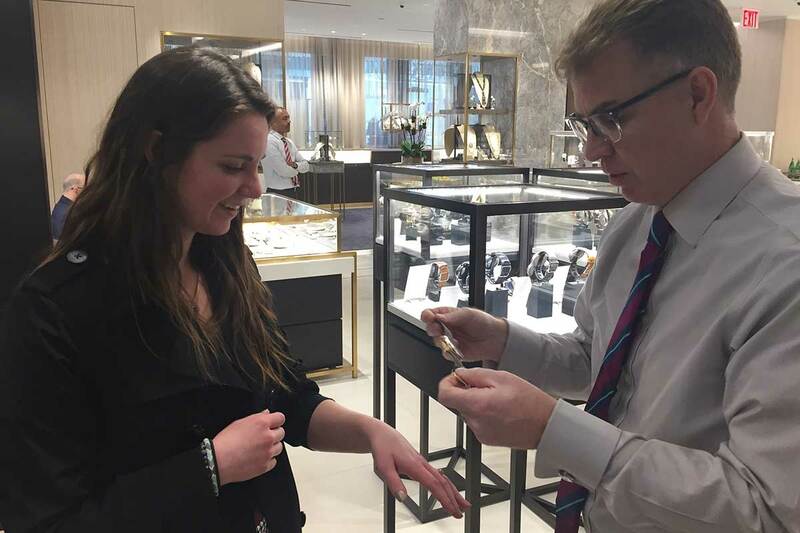 Corinne Dedrick, Education Programs Coordinator, with the assistance of Scott Hickey, Cellini Jewelers Marketing Director, trying on an H. Moser & Cie Purple Rose Gold Endeavour Center Seconds wristwatch. Photo by Keith Lehman. 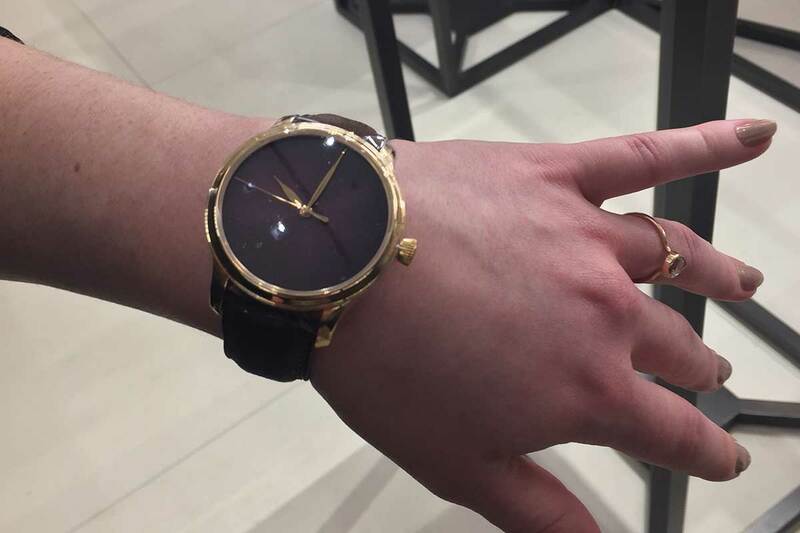 On February 27, 2019, Corinne Dedrick, Education Programs Coordinator, and I traveled to New York City on a special invitation to attend the Cellini Watch Fair held at the Cellini Jewelers store on 430 Park Avenue at 56th Street. The fair lasted from February 26 to March 2, with each day having a different theme. On the day we attended, a host of Ulysse Nardin watch family lines were celebrated including the new Freak X, Skeleton X, Diver, and the Manara. 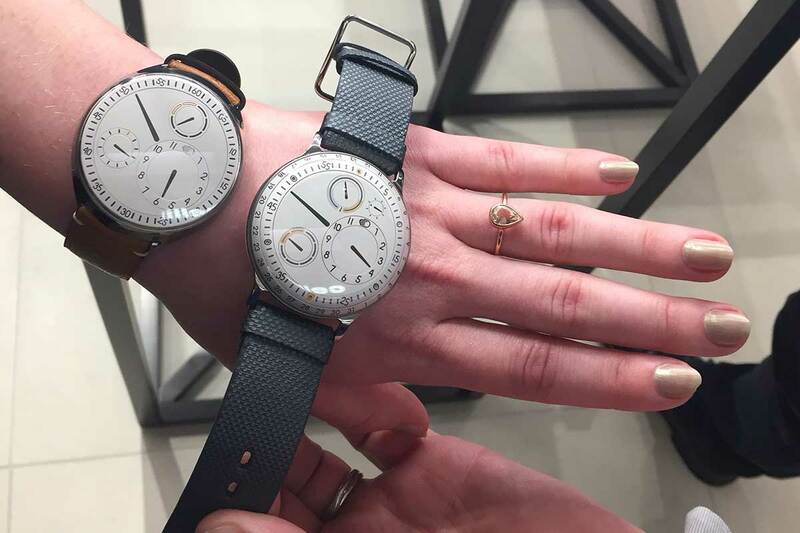 These watches were on prominent display in the front of the store. Other well-known brands were represented, such as A. Lange & Sohne, Girard-Perregaux, and Jaeger-LeCoultre. But lesser known names such as Ressence and Romain Gauthier were showcased as well. Scott Hickey, Cellini Jewelers Marketing Director, took time with Corinne and me so we could try on many wonderful watches. His in-depth knowledge of each brand was impressive. 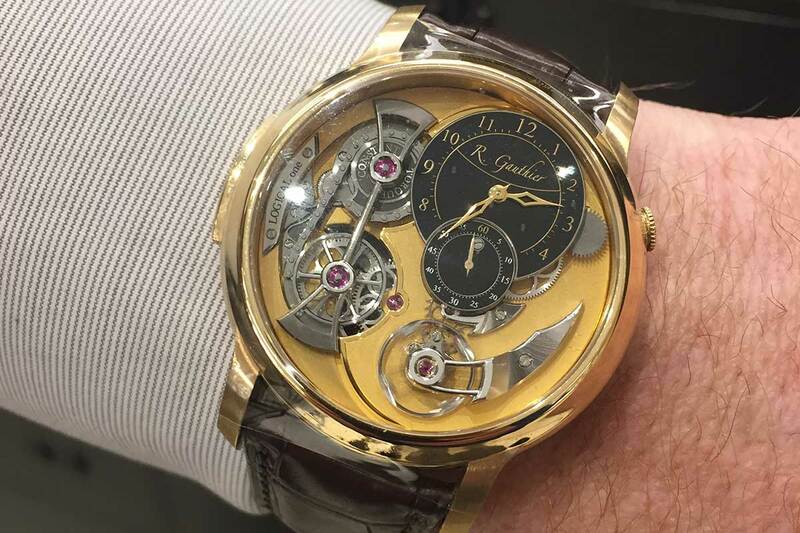 Romain Gauthier Logical One Yellow Gold wristwatch. Photo by Keith Lehman. H. Moser & Cie Purple Rose Gold Endeavour. Photo by Keith Lehman. Corinne Dedrick, Education Programs Coordinator, comparing the Ressence Type 1 Slim, worn on her wrist, to the Ressence Type 3 wristwatch. Photo by Keith Lehman. There was a reception in the evening that many personalities of the horological scene attended, including RedBar Group President, Adam Craniotes, and Chief Executive Officer, Kathleen McGivney. Also attending was actor and Basil Time Piece founder, Aldis Hodge. As representatives of the NAWCC, Corinne and I felt most welcome in the Big Apple. Become a member of the National Association of Watch & Clock Collectors today. This organization, and your membership to it, is important to a small, yet amazingly potent international community. You may be surprised where it can take you.